As more books became available (as the platform has gained traction with users), so the tendency grew to “pack” books with material not necessarily related to the update in question… it was perhaps inevitable — if a little unfair to readers — to cover aspects of usage that were common to OS X in general, while marketing titles as specific to that version. While some background is always needed, and while it’s nigh impossible to fill a book of over 750 substantive pages with details of what’s new in Mountain Lion, experienced author Galen Gruman does an excellent job of striking a balance between emphasizing 10.8’s innovations and setting them in the context of the system’s wider usage. This means that there’s no major, important or tricky aspect of Mountain Lion’s new features that’s omitted. The emphasis is on how they’re each and all actually used in practice. This makes for easy reading and for a smooth transition from other cats for the average user. If you do want to scoop up and concentrate on just the new features of 10.8, there’s an appendix of some 15 pages, which can be used as reference. This, note, is not so comprehensive as a resource like Chris Kennedy’s excellent “Use OS X Mountain Lion’s New Features” (in the 10-Minute Fixes series), ISBN-10: 1937842029 ISBN-13: 978-1937842024 and also on Kindle, which is to be preferred for that purpose. But for users from beginner to advanced, experienced user to “switcher”, Gruman’s “OS X Mountain Lion Bible” is hard to beat for its depth and breadth of coverage. Each of these sections contains between two and eight chapters of between one and two dozen (Mail and setting System Preferences have 40 or so) pages. These take the reader carefully and logically through what’s needed to understand, make the most of and — if necessary set up, tweak or troubleshoot — each aspect of the System. Of course, there are bound to be highly specific details of usage which aren’t covered. But they’re not many… setting up the keyboard alone commands nearly three full and detailed pages; managing multiple applications (switching, hiding and focus etc) almost three; controlling Safari nearly six. That degree of thoroughness is typical of “OS X Mountain Lion Bible”. When you also consider how logically, structurally transparent (multiple steps, multiple options are clearly displayed) is the treatment of all such areas, it’s easy to see why it won’t be long before you keep the book close; and come to rely on it often. “OS X Mountain Lion Bible” is extremely well laid out. It’s full — as you ought to expect — of tables, lists, screen grabs (though these are at times a little cramped), tips, notes, call-outs to new features, pointers to parallel and/or more detailed coverage elsewhere in the book, and pleasingly meaningful and explanatory captions. Gruman also uses headings, sub-headings, summaries, bulleted lists, and varying font conventions with plenty of white space to guide the reader through his material. Not only does this make for an attractive visual appeal to the book; it also aids navigation considerably. It’s almost impossible to pack as many illustrations from a sophisticated OS like Apple’s without sacrificing some clarity. Yet they’re all legible one way or another, although you might need help with reproductions like those on page 528 dealing with the mouse (system) preferences. Fortunately, Gruman’s annotations are so illuminating that they support what might otherwise be a little hard to discern. 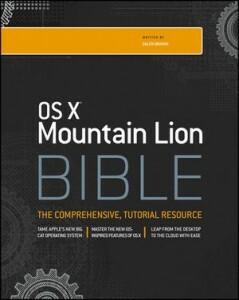 With much of the information contained in “OS X Mountain Lion Bible” available online, why spend $40 on a book? Three reasons. This book is one of very few so far available that pleasingly combine authoritativeness and accuracy with comprehensiveness — everything is in one place. Secondly, the author’s style is in no small part conducive affording new, puzzled, curious and demanding readers the kind of understanding they need really to make the most of Mountain Lion. Lastly, although this book can never be so current as the many hundreds of sites and documents online, few if any of the latter are organized as accessibly and straightforwardly as Gruman has done in “OS X Mountain Lion Bible”. In other words, the merits of having the information as expertly organized as this, and having it at your elbow, are still considerable. The index in the book has been very well compiled and will help if Gruman’s clear and transparent structure don’t immediately lead you to just where you want… there are entries for “Merge selected cards option”, “IP Pane, Add dialog box” and “VoiceOver cursor subpane, VoiceOver Utility” for instance. There is also a glossary of almost three dozen pages. That the book has such a clear and accessible Contents section also helps in finding your way around. Other books on Mountain Lion are now appearing weekly. We’ll cover some of them here on MyMac. It’s good to know that the “Bible” series keeps its claim to be one of the more reputable and reliable. Galen Gruman covers the vast majority of the features that 10.8 supports. Those new to the platform will welcome his sections on “Understanding the Desktop”, “Working with Menus” and a nicely exhaustive look at the Finder’s View modes, for example. More experienced users will be glad of his exposition of, say, configuring the Calendar app. to behave — and integrate with other services — just as you want it to. Time after time, all the preferences, settings, options, (hidden, or esoteric) features are there. Cons: screen shot size — a minor cavil.